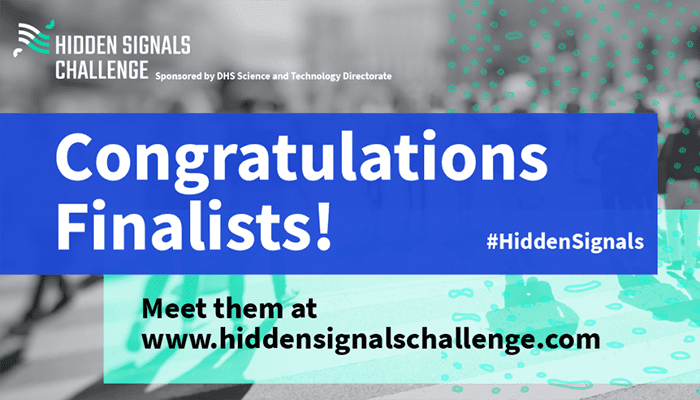 The Department of Homeland Security (DHS) Science and Technology Directorate (S&T), in collaboration with the Office of Health Affairs National Biosurveillance Integration Center (NBIC), today announced five finalists for Stage 1 of the Hidden Signals Challenge. The challenge calls for the design of an early warning system that uses existing data to uncover emerging biothreats. The announcement was made at the American Society for Microbiology’s 2018 ASM Biothreats meeting. Computational Epidemiology Lab at Boston Children’s Hospital, Boston, MA for Pandemic Pulse, a tool that integrates six data streams to detect bio-threat signals. First, it alerts agencies using Twitter, Google Search, transportation, news, and HealthMap data of an anomaly in the data stream, then it tracks potential biothreats using live transportation data on Flu Near You. Readiness Acceleration & Innovation Network (RAIN), Tacoma, WA forCommuter Pattern Analysis for Early Biothreat Detection, a system that cross-references de-identified traffic information with existing municipal health data and internet keyword searches. The tool will be developed to recognize commuter absenteeism to flag a possible disease outbreak. Vituity, Emeryville, CA for Monitoring emergency department wait times to detect emergent influenza pandemics, a model that alerts authorities of spikes in emergency room wait times that can be attributed to emergent flu pandemics. The solution sources real-time data from a network of 142 hospitals in 19 states and is updated hourly, allowing agencies to quickly intervene. William Pilkington & team, Cabarrus County, North Carolina, for One Health Alert System, a symptoms database that analyzes the Daily Disease Report’s top ten symptoms as seen by 43 health care providers in North Carolina. The model flags disease outbreak using textual predictive analytics and accounts for seasonal rates of change. Daniel B. Neill and Mallory Nobles, Pittsburgh, PA,for Pre-syndromic Surveillance, a machine learning system that overlays real-time emergency room chief complaint data with social media and news data using the semantic scan, a novel approach to text analysis. The model detects emerging clusters of rare disease cases that do not correspond to known syndrome types. A panel of judges with expertise in bioinformatics, biological defense, epidemiology, and emergency management helped to select these five finalists. Each finalist will receive $20,000 and advance to Stage 2 of the Challenge. During Stage 2, finalists will further develop their concepts into detailed system designs with guidance from expert mentors. At the conclusion, the judges will select a winner to receive the $200,000 grand prize. Source: U.S. Department of Homeland Security, adapted.